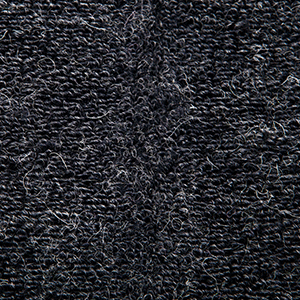 Warm fabric: 61%Acrylic,27%Wool,9%Polyester,3%Elastane. 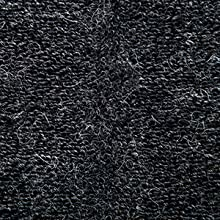 Soft wool material ensures heat retention and it's skin-friendly, non-pruritic. 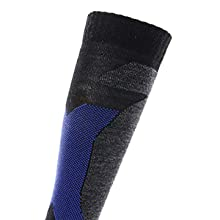 Full Cushion and Added Support: 1)With a full cushion throughout the leg and foot of the sock;2)Seamless toe: A toe seam that doesn't cause discomfort;3)Reinforced Shin: For added protection in key impact zone;4)With built-in arch support and ankle brace that keeps you stable and still provides a full range of motion. 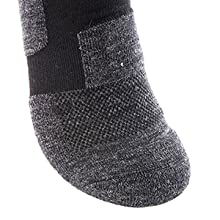 Moisture absorption: Acrylic fiber is of good moisture absorption and breathability; Moisture Transport System of the socks wicks sweat away from your feet. Super breathability: With breathable fabric and moisture wicking panel on calves, instep, and toes conducive to the efficient and sweat, making the experience more comfortable. Compression function: Slight pressure on calves can relieve muscle aches after an intense workout. Application: Winter outdoor sports, Skiing, Snowboarding, Snowmobile, Climbing, Mountaineering, Ice skating, general workouts and other winter sports; Fantastic gift for your friends and family. When a cold snap threatens to chase you off the mountain, pull on the Wantdo Ski Socks and ski on. Made from soft and durable merino wool, these socks deliver maximum warmth while remaining breathable. Strategic cushioning zones are placed at five areas where ski boots make the most contact, as well as providing extra cushioning at the Achilles and ankle. 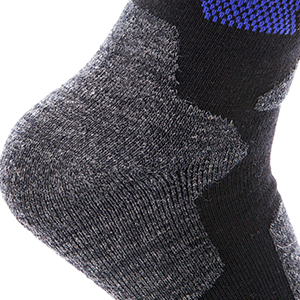 Nylon fibers improve durability and Lycra adds stretch so the sock conforms to your foot for an optimal fit. Seamless construction keeps chafing and blisters away. With breathable fabric, while moving sweat away so your foot stays comfortable and your feet air out quickly after you pull your boots off. With built-in arch support and ankle brace that keeps you stable and still provides full range of motion. Performance-enhancing wool keeps your feet warm while wicking away sweat, while mesh ventilation zones offer additional breathability.